Eric Vero’s eyes widen when he talks about his grandfathers’ wartime experiences. They were just young boys living in separate villages in Italy during the Second World War, Vero said during a recent interview. One grandfather grins whenever he talks about the time American soldiers liberated his town and handed out care packages. “That was the first time he ate chocolate,” Vero says. And an old family friend regaled Vero with tales of how they hid in a crypt beneath a monastery as battles raged above. For Vero, war history and family history march together, side-by-side. During his 1st year, Vero quickly got to know his teachers by attending the “meet the professor” events hosted by the History Students’ Association. 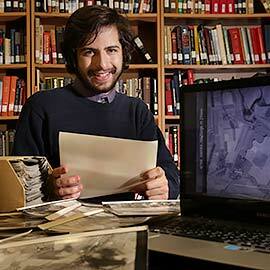 In his second year, he joined a troop of two dozen student volunteers who scanned 130,000 Second World War aerial photos of Europe and posted them online for the general public and other researchers. The terrain pictured in those old black-and-white photos soon came to life for Vero during a study tour of battlefields in northern Europe where he presented a research paper on a famous Canadian soldier from the First World War and took part in a remembrance ceremony at The Menin Gate in Ypres, Belgium. Since then, in addition to his regular classes, Vero has been working as a research assistant to a professor exploring life in Montreal during the First World War as debate over conscription raged. Vero combs through reels of microfiche of the Montreal Star newspaper, finds the names and addresses of casualties and enters them in a database. War stories are family stories. They’re stories of humanity at its best and worst. And as his graduation approaches, Vero has set his sights on taking a master’s degree in the U.K.
“I do feel quite prepared for moving forward,” he said. One of the strengths of Laurier’s History department is all of the learning opportunities inside and outside of classes — opportunities to learn about many facets of history, not only military history — made available to students. It’s also an environment that’s not stuck in the past. Laurier scholars are keeping pace with the rise of digital storytelling. “We’re pushing into new technologies,” Monod says. For example, Laurier researchers are making Canadian history videos that high school teachers will be able to download and use in their classrooms. “As the world changes and storytelling changes, we change with it,” Monod says.